That's right! She has created another pattern book, that I must have. It was just released on the 25th of August and guess what..it is full of HANDBAGS!!!! Yes....26 HANDBAGS to be exact!!!! 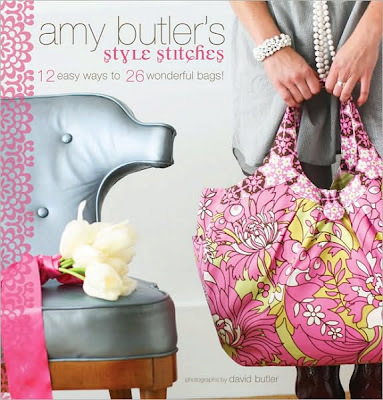 The book is titled Stylish Stitches: 12 Easy Ways to 26 Wonderful Bags. Mine should be here tomorrow and I cannot wait to thumb through it and add my page tabs. And please be warned, if you are a woman and normally get a birthday/Christmas gift from me, it will probably be a handbag this year:) Just thought that I should warn you! Please be sure to check out my other two favorites from Amy, Little Stitches for Little Ones, which features infant/toddler sewing projects and In Stitches, which is all about stuff for you and your home. Outside of the fabulous projects that all of the books contain, I also love the fact that patterns are enclosed in a cute pocket inside of each and that they are all on a spiral bound which allows for easy viewing when sewing. Okay...enough of the AB marketing...have a great evening! These look really cute. I need to try to make one this fall. Maybe we can try one at the same time. @Kristy...get the book and we can work on a pattern at the same time and post out final products. That way, we can help each out along the way if we get stuck. You game? I am game. I need to order the book and give my time to find some unique fabrics. @Kristy...that is PERFECT! Get the book at bn.com...about $10 cheaper than in store and shipping is normally free if you are a member! I will interested to see which one you want to make first...I already have one in mind! @Mary, you make a VERY good point!